کانی‌سازی‌های چندفلزی آهن (± فلزات‌پایه، نقره و طلا) محدوده شمال کبودان (خاور روستای سربرج)، در میزبان ریولیت‌های برشی- پورفیری و سنگ‌های پلیتیک‌شیست سازند تکنار تشکیل شده است. 3 افق سنگی شامل، ریولیت ریزبلور زیرین (کمرپایین)، افق ریولیت پورفیری کانه‌دار و سنگ‌های گرانیتوییدی تا آندزیت تأخیری (کمربالا) در منطقه تشخیص داده شد. شواهد لیتوژئوشیمی حاکی از آن است که ریولیت‌های ریزبلور افق زیرین با ماهیت ساب‌آلکالن (7/0>Nb/Y) و نسبت‌های Zr/TiO2 (608 تا 930) و Zr/Sc (3/13 تا 3/36) به تدریج در افق‌های فوقانی توسط ریولیت‌های پورفیری افق کانه‌دار با ماهیت آلکالن (7/0<Nb/Y) و نسبت‌های Zr/TiO2 (380 تا 1116) و Zr/Sc (5/22 تا 116) جایگزین می‌شوند. کنترل حرارتی ماگما و ذوب بخشی مذاب ریولیتی در دمای بالا، موجب افزایش نسبت HFSE به عناصر سازگار (نظیر Zr/TiO2 و Zr/Sc) و متعاقباً رخداد عناصر کانه‌ساز در ریولیت‌های پورفیری افق کانه‌دار شده است. طبق شواهد، رخدادهای معدنی چندفلزی در منطقه شمال کبودان به ویژه در مرز افق ریولیتی‌ زیرین و افق کانه‌دار، احتمالاً متأثر از وقوع تحولات لیتوژئوشیمیایی سنگ‌ میزبان فلسیک و به ویژه افق ریولیت پورفیری انجام شده است. The polymetallic Fe (±Base metal, Ag and Au) of northern Kabudan (eastern of Sarborj village), occurs within breccia-porphyry rhyolite and pelitic-schist of the Taknar Formation. Based on field evidence, three rock units including: fine-grain rhyolite (footwall), porphyritic rhyolite (ore horizon) and late granitoid-andesitic rocks (hangingwall), are recognized in this area. Lithogeochemical signatures reveal that the fine-grain rhyolite of lower horizon with sub-alkaline geochemical signatures of (Nb/Y<0.7), low Zr/TiO2 (608-930) and Zr/Sc (13.3-36.3) is successive replaced by ore-bearing porphyritic rhyolite with alkaline (Nb/Y>0.7), slightly higher values of Zr/TiO2 (380-1116) and Zr/Sc (22.5-116). Are thought to be the magma thermal control and partial melting of rhyolite in high temperature can be increasing HFSE/compatible element ratio (e.g., Zr/TiO2 and Zr/Sc) and eventually metal occurrence in porphyritic rhyolite are interpreted to have been concentration of ore minerals. Finally, the polymetallic mineralization in northern Kabudan, adjacent to lower rhyolitic unit and ore horizon is probably occurs as a result of lithogeochemical evolution of porphyritic rhyolite felsic rocks. افتخارنژاد، ج.، آقانباتی، س. ع. و حمزه‎پور، ب.، 1355- برگه زمین‌شناسی کاشمر در مقیاس 1:250000، سازمان زمین‌شناسی کشور. آقانباتی، س. ع.، 1383- زمین‌شناسی ایران، انتشارات سازمان زمین‌شناسی کشور، 606 ص. حیدریان‌شهری، م. ر.، کریم‎پور، م. ح. و ملک زاده، آ.، 1385- اطلاعات مغناطیسی- ردیاب کانسار مسیوسولفید پلی‌متال تکنار، مجله علوم دانشگاه تهران، جلد 32، شماره 2، صص. 1 تا 14. 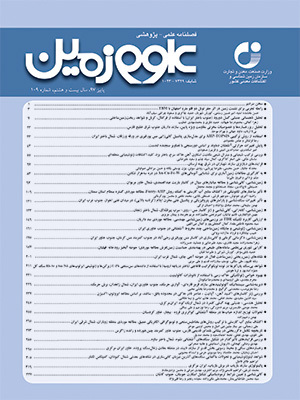 شهرابی، م.، حسینی، ح. و شعبانی، ک.، 1385- برگه زمین‌شناسی بردسکن در مقیاس 1:100000، سازمان زمین‌شناسی کشور. صفری، م.، 1388- گزارش پی‌جویی برگه 1:25000 کبودان (منطقه بردسکن)، سازمان زمین­شناسی و اکتشافات معدنی کشور، مدیریت منطقه شمال خاور. طالع فاضل، ا.، 1395- خصوصیات لیتوژئوشیمیایی و تحولات ماگمایی مرتبط با کانی‌سازی در ذخایر سولفید توده‌ای آتشفشان‌زاد: مطالعه موردی نشانه‌های معدنی شمال کبودان (کمپلکس تکنار)، هشتمین همایش انجمن زمین‌شناسی اقتصادی، دانشگاه زنجان. منظمی باقرزاده، ر.، کریم‎پور، م. ح.، فارمر، ج. ل.، استرن، چ.، سانتوس، ژ. ف.، ریبیرو، س.، رحیمی، ب. و حیدریان شهری، م. ح.، 1395- ژئوکرونولوژی (U-Pb) زیرکن، پتروگرافی، ژئوشیمی و رادیوایزوتوپ‌های متاریولیت‌های برنورد (مرکز زون تکنار- شمال باختر بردسکن)، مجله زمین‌شناسی اقتصادی، جلد 8، شماره 1، صص. 239 تا 264. مهرابی، ب.، حیدرپور، ر.، طالع فاضل، ا. و صفری، م.، 1390- مطالعه کانی‌سازی و رخداد ذخایر سولفید توده‌ای غنی از آهن شمال کبودان (بردسکن)، با استفاده از شواهد زمین‌شناسی کانسنگ و ژئوشیمی، دومین همایش انجمن زمین‌شناسی اقتصادی، دانشگاه لرستان. Barrie, C. T., Ludden, J. N. and Green, T. H., 1993- Geochemistry of volcanic rocks associated with Cu-Zn and Ni-Cu deposits in the Abitibi sub-province. Economic Geology, 88, 1341–1358. Barth, M. G., McDonough, W. F. and Rudnick, R. L., 2000- Tracking the budget of Nb and Ta in the continental crust. Chemical Geology, 165, 197–213. Bea, F., 1996- Controls on the trace element composition of crustal melts: Transactions of the Royal Society of Edinburgh. Earth Sciences, 87, 33–41. Bissig, T., Mortensen, J. K. and Tosdal, R. M., 2008- The rhyolite-hosted volcanogenic massive sulfide district of Cuale, Guerrero Terrane, West-Central Mexico: silver-rich, base metal mineralization emplaced in a shallow marine continental margin setting. Economic Geology, 103, 141–159. Boynton, W. V., 1984- Geochemistry of the rare earth elements: Meteorite studies, in Henderson, P., ed., Rare earth element geochemistry. Amsterdam, Elsevier, 63–114. Corbett, K. D., 1992- Stratigraphic-volcanic setting of massive sulfide deposits in the Cambrian Mount Read volcanics, Tasmania. Economic Geology, 87, 564–586. Green, T. H. and Pearson, N. J., 1987- An experimental study of Nb and Ta partitioning between Ti-rich minerals and silicate liquids at high pressure and temperature. Geochimica et Cosmochimica Acta, 51, 55–62. Green, T. H., 1995- Significance of Nb/Ta as an indicator of geochemical processes in the crust-mantle system. Chemical Geology, 120, 347–359. Hart, T. R., Gibson, H. L. and Lesher, C. M., 2004- Trace element geochemistry and petrogenesis of felsic volcanic rocks associated with volcanogenic massive Cu-Zn-Pb sulfide deposits. Economic Geology, 99, 1003–1013. Irvine, T. N. and Baragar, W. R. A., 1971- A guide to the chemical classification of the common volcanic rocks. Canadian Journal of Earth Sciences, 8, 523–548. Ishikawa, Y., Sawaguchi, T., Ywaya, S. and Horiuchi, M., 1976- Delineation of prospecting targets for Kuroko deposits based on modes of volcanism of underlying dacite and alteration haloes. Mining Geology, 26, 105–117. Karimpour, M. H. and Maleckzadeh, A., 2005- Taknar polymetal (Cu-Zn-Au-Ag-Pb) deposit: A new type magnetite-rich VMS deposit, northeast of Iran. Journal of sciences, Islamic Republic of Iran, 16, 239-254. Le Bas, M. J., Le Maitre, R. W., Streckeisen, A. and Zannetin, B., 1986- A chemical classification of volcanic rocks based on the total alkali-silica diagram. Journal of Petrology, 27, 745–750. Le Maitre, R. W., Bateman, P., Dudek, A., Keller, J., Lameyre, J., Le Bas, M. J., Sabine, P. A., Schmid, R., Sorensen, H., Streckeisen, A., Wooley, A. R. and Zanetti, B., 1989- A classification of igneous rocks and glossary of terms. Blackwell, Oxford. Leat, P. T., Jackson, S. E., Thorpe, R. S. and Stillman, C. J., 1986- Geochemistry of bimodal basalt-subalkaline/peralkaline rhyolite provinces within the southern British Caledonides. Journal of the Geological Society of London, 143, 259–273. Lentz, D. R., 1996- Trace element systematics of felsic volcanic rocks associated with massive-sulfide deposits in the Bathurst mining camp: Petrogenetic, tectonic and chemostratigraphic implications for VHMS exploration. Geological Association of Canada Short Course Notes, 12, 359–402. Lentz, D. R., 1998- Petrogenetic evolution of felsic volcanic sequences associated with Phanerozoic volcanic hosted massive sulphide systems: The role of extensional geodynamics. Ore Geology Reviews, 12, 289–327. Lentz, D., 1999- Petrology, geochemistry, and oxygen isotope interpretation of felsic volcanic and related rocks hosting the Brunswick 6 and 12 massive sulfide deposits (Brunswick belt), Bathurst mining camp, New Brunswick, Canada. Economic Geology, 94, 57–86. Lesher, C. M., Goodwin, A. M., Campbell, I. H. and Gorton, M. P., 1986- Trace element geochemistry of ore-associated and barren felsic metavolcanic rocks in the Superior province, Canada. Canadian Journal of Earth Sciences, 23, 222–237. Lindenberg, H. G. and Jacobshagen, V., 1983- Post-Paleozoic geology of the Taknar zone and adjacent area, Hart, T.R., Gibson, H.L., and Lesher, C.M. (2004). Trace element geochemistry and petrogenesis of felsic volcanic rocks associated with volcanogenic massive Cu-Zn-Pb sulfide deposits. Economic Geology, 99, 1003–1013. Maniar, P. D. and Piccoli, P. M., 1989- Tectonic discrimination of granitoids. Geological Society of America Bulletin, 101, 635–643. Mercier-Langevin, P., Dube, B., Hannington, M. D., Davis, D. W., Lafrance, B. and Gosselin, G., 2007- The LaRonde Penna Au-rich volcanogenic massive sulfide deposit, Abitibi greenstone belt, Quebec: Part I. Geology and geochronology. Economic Geology, 102, 585–609. Monazzami Bagherzadeh, R., Karimpour, M. H., Farmer, G. L., Stern, C. R., Santos, J. F., Rahimi, B. and Heidarian Shahri, M. R., 2015- U–Pb zircon geochronology, petrochemical and Sr–Nd isotopic characteristic of Late Neoproterozoic granitoid of the Bornaward complex (Bardaskan-NE Iran). Journal of Asian Earth Sciences, 11, 54–71. Morris, G. A., Larson, P. B. and Hooper, P. R., 2000- Subduction style” magmatism in a non-subduction setting: The Colville Igneous Complex, NE Washington State, USA. Journal of Petrology, 41, 43–67. Muller, R. and Walter, R., 1983- Geology of the Precambrian-Paleozoic Taknar inlier north east of Kashmar, Khorasan Province, NE Iran. Geological Survey of Iran (GSI), 51, 165-183. Nakamura, N., 1974- Determination of REE, Ba, Fe, Mg, Na, and K in carbonaceous and ordinary chondrites. Geochimica et Cosmochimica Acta, 38, 757–775. Ohmoto, H. and Skinner, B. J. (eds. ), 1983- The Kuroko and related volcanogenic massive sulfide deposits. Economic Geology Monograph 5, 604 p.
Pearce, J. A., 1996- A user’s guide to basalt discrimination diagrams. Geological Association of Canada Short Course Notes, 12, 79–113. Pearce, J. A., and Peate, D. W., 1995- Tectonic implications of the composition of volcanic arc magmas. Annual Reviews in Earth and Planetary Science, 23, 251–285. Pearce, J. A., Harris, N. B. W. and Tindle, A. G., 1984- Trace element discrimination diagrams for the tectonic interpretation of granitic rocks. Journal of Petrology, 25, 956–983. Piercey, S. J., Paradis, S., Murphy, D. C. and Mortensen, J. K. 2001- Geochemistry and paleotectonic setting of felsic volcanic rocks in the Finlayson Lake volcanic-hosted massive sulfide district, Yukon, Canada. Economic Geology, 96, 1877–1905. Saeki, Y. and Date, J., 1980- Computer application to the alteration data of the footwall dacite lava at the Ezuri Kuroko deposits, Akito Prefecture. Mining Geology, 30, 241–250. Spitz, G. and Darling, R., 1978- Major and minor element lithogeochemical anomalies surrounding the Louvem copper deposit, Val d’Or, Quebec. Canadian Journal of Earth Sciences, 15, 1161–1169. Stoltz, A. J., 1995- Geochemistry of the Mount Windsor Volcanics: Implications for the tectonic setting of Cambro-Ordovician volcanic-hosted massive sulfide mineralization in northeastern Australia. Economic Geology, 90, 1080–1097. Sun, S. S. and McDonough, W. F., 1989- Chemical and isotopic systematics of oceanic basalts: Implications for mantle composition and processes. Geological Society Special Publication 42, 313–345. Taylor, S. R. and McLennan, S. M., 1985- The continental crust: Its composition and evolution. Oxford, Blackwell Scientific Publications, 312 p.
Watson, E. B. and Harrison, T. M., 1983- Zircon saturation revisited: Temperature and composition effects in a variety of crustal magma types. Earth and Planetary Science Letters, 64, 295–304. Watson, E. B., 1996- Dissolution, growth and survival of zircons during crustal fusion: Kinetic principles, geological models and implications for isotopic inheritance: Transitions of the Royal Society of Edinburgh. Earth Sciences, 87, 43–56. Whalen, J. B., Currie, K. L. and Chappell, B. W., 1987- A-type granites: Geochemical characteristics, discrimination and petrogenesis. Contributions to Mineralogy and Petrology, 95, 420–436. Whalen, J. B., Rogers, N. Van Staal, C. R., Longstaffe, F. J., Jenner, G. A. and Winchester, J. A., 1998- Geochemical and isotopic (Nd, O) data from Ordovician felsic plutonic and volcanic rocks of the Miramichi Highlands: Petrogenetic and metallogenic implications for the Bathurst mining camp. Canadian Journal of Earth Sciences, 35, 237–252. Whitney, D. L. and Evans, B. V., 2010- Abbreviations for names of rock-forming minerals. American Mineralogist, 95, 185−187.